Just prior to crossing the Tsugaru Channel in northern Japan, Stephen Redmond passed up all the seafood and seaweed that he was offered by his Japanese hosts. Redmond later became the first person to complete the Oceans Seven, prefering to exist on mostly white bread and politely refusing all the marine algae that the local Japanese offered during their morning, afternoon and evening meals. Catharine Arnston is not a swimmer, but her life and profession is engulfed with a fundamental product of the ocean. Arnston started ENERGYbits® after her sister was diagnosed with breast cancer and was advised by her oncologist that an alkaline diet would help her heal. "I love to research so I helped my sister find foods. I was intrigued by what I was learning about algae and soon convinced this was a diet that needed to be followed. I was only trying to help my sister, but the more I researched, the more I knew I had to share this with other people." After she learned that algae was the most alkaline, plant-based, nutrient-dense food in the world and is used in Asia to improve health and longevity, she knew she had discovered something big. "I learned algae had 64% protein, 40 vitamins and minerals, and was endorsed by the United Nations and NASA as the most nutrient-dense food in the world. I also discovered there were 100,000 studies documenting its long list of benefits and it was the most sustainable, eco-friendly food crop in the world. And yet algae remained virtually unknown outside of Asia." Arnston is a marketer so she got to work to create a healthy game changer and went about to convince Americans that eating algae is not weird. And so ENERGYbits® was founded. Over the last decade, she has used all her creative energies to produce and market an organically grown, toxin-free, Non-GMO algae tablets. She explains, "A handful of tablets will satisfy your hunger, give you steady energy, improve your focus, remove toxins, support your health, boost your skin and hair and ensure your nutritional needs are met. All this from a food that has one ingredient, no chemicals, caffeine, sugar or processing and is the most sustainable, safe, eco-friendly, crop in the world - algae." Arnston offers three different products: ENERGYbit and BEAUTYbits from spirulina algae and RECOVERYbit from chlorella algae. She describes the products, "Spirulina algae (ENERGYbits and BEAUTYbits) is regarded as one of the most protective, functional and healing foods of the 21st century and boasts an unmatched nutrient profile. Spirulina has the highest concentration of protein in the world (3 times steak) and it is a powerhouse of 40 vitamins, minerals, antioxidants and other nutrients that work synergistically and naturally to elevate your energy, improve your mental focus enhance your skin and hair health, improve your athletic performance boost your vitality, reduce your cellular inflammation and support your optimal health. In 1974, the United Nations even identified spirulina as the answer to world hunger. Chlorella algae (RECOVERYbits) has wellness and medicinal properties including its unique ability to chelate metals including mercury and lead. Chlorella algae has the highest concentration of chlorophyll in the world. Chlorophyll is what makes plants green and it is essential for cellular health, cleansing your body and helping to prevent disease like cancer or lung disease. Chlorella also has high amounts of bio-available organic iron, the highest amount of RNA and DNA in the world, chlorella growth factor, and forty other vitamins and minerals that help to boost your immune system, speed cellular renewal, support mitochondria function, reduce aging accelerate recovery from athletics and improve eye health. Chlorella even removes alcohol so it helps reduce hangovers. Chlorella algae also contains a rare source of natural Vitamin K2 which supports heart health, bone health and skin health. In fact recent research has found that heart disease is due to calcification of your blood vessels. Only Vitamin K2 can remove this calcium out of your blood vessels and move it into your bones where it should be. 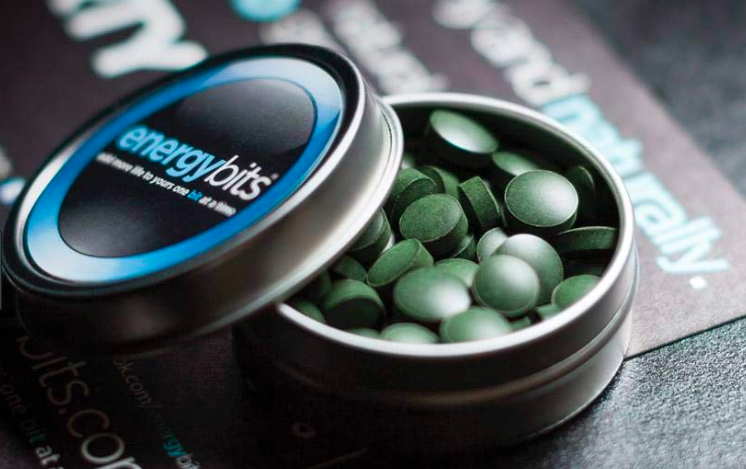 You can take a handful of chlorella tablets every night or after a workout to flood your body with its healing, cleansing recovery and biohack properties. You can swallow or snack on them either alone or with macadamia nuts, blended with smoothies, added salads, trail mix or anything you like including with slices of fruit or even dark chocolate and sea salt." For more information, visit www.energybits.com.